We're more than just an oil change. Customize a maintenance program for your vehicle fleet! Set your vehicle preferences and track your service history. Expand your automotive knowledge with our tips and advice. Find savings that suit your vehicle's needs. We are proud to offer our customers more than one way to save. Get financing and flexibility with a Jiffy Lube® Credit Card. This is a gift that’s practical, functional and unexpectedly cool. Get in touch with our team online or on the phone with your comments, questions, or suggestions. Submit feedback about your Jiffy Lube® experience. 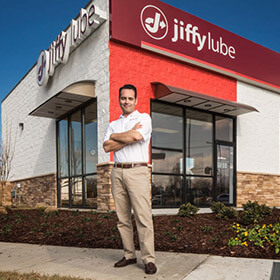 Discover how Jiffy Lube® can help you turn your professional dreams into reality. We've got answers to all of your Jiffy Lube® questions. ©2019 Jiffy Lube International, Inc.